1903 manual switch for four subscriber lines (top) with four cross-bar talking circuits (horizontal), and one bar to connect the operator (T). The lowest cross-bar connects idle stations to ground to enable the signaling indicators (F). In 1887 Puskás introduced the multiplex switchboard.[vague]. Circuits interconnecting switches are called trunks. Before Signalling System 7, Bell System electromechanical switches in the United States originally communicated with one another over trunks using a variety of DC voltages and signaling tones, replaced today by digital signals. Some signaling communicated dialed digits. An early form called Panel Call Indicator Pulsing used quaternary pulses to set up calls between a panel switch and a manual switchboard. 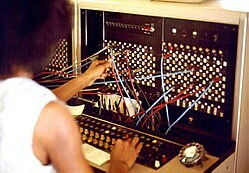 Probably the most common form of communicating dialed digits between electromechanical switches was sending dial pulses, equivalent to a rotary dial's pulsing, but sent over trunk circuits between switches. 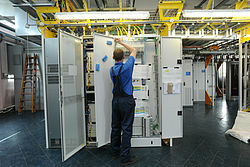 Nokia Siemens Networks EWSD originally developed by Siemens, Bosch and DeTeWe [de] for the German market is used throughout the world. Digital switches encode the speech going on, in 8,000 time slices per second. At each time slice, a digital PCM representation of the tone is made. The digits are then sent to the receiving end of the line, where the reverse process occurs, to produce the sound for the receiving phone. In other words, when someone uses a telephone, the speaker's voice is "encoded" then reconstructed for the person on the other end. The speaker's voice is delayed in the process by a small fraction of one second — it is not "live", it is reconstructed — delayed only minutely. The connections between layers of subswitches of telephone switching system are scarce resources, allocated by special control logic in a fault tolerant manner. Clos networks are often used. Second Avenue exchange, NYC, site of the 1975 New York Telephone Exchange fire. ^ "General Definitions". Verizon service. Verizon Enterprise Solutions. ^ Private Telegraphs, The Sydney Morning Herald, credited to The Times, April 19, 1878, p. 6. ^ Bo Leuf (2002). Peer to Peer: Collaboration and Sharing Over the Internet. Addison-Wesley. p. 15. ISBN 9780201767322. ^ Alvin K. Benson (2010). Inventors and inventions Great lives from history Volume 4 of Great Lives from History: Inventors & Inventions. Salem Press. p. 1298. ISBN 9781587655227. ^ "TIVADAR PUSKÁS (1844 - 1893)". 4 February 2011. Archived from the original on 4 February 2011. ^ "SZTNH". Mszh.hu. Retrieved 2012-07-01. ^ "Puskás, Tivadar". Omikk.bme.hu. Retrieved 2012-07-01. ^ "Welcome hunreal.com - BlueHost.com". Hunreal.com. Archived from the original on 2012-03-16. Retrieved 2012-07-01. ^ "120 Year Telephone aniversary". 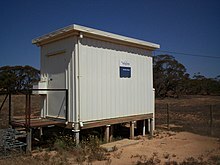 cdrecord.org. ^ National Park Service "first switchboard" page. ^ "Early Manchester telephone exchanges" (PDF). mosi.org.uk. Archived from the original (PDF) on 2013-06-05. Retrieved 2013-07-30. ^ a b Calvert, J. B. (2003-09-07). "Basic Telephones". Archived from the original on 2003-12-27. Retrieved 2007-09-13. ^ Calvert, J. B. (2003-09-07). "Basic Telephones, The Switchboard (ringdown is near bottom)". Archived from the original on 2003-12-27. Retrieved 2006-09-13. ^ Source: from Federal Standard 1037C. ^ a b Connected to a switch, an off-hook condition operates a relay to connect the line to a dial tone generator and a device to collect dialed digits. ^ Andrew Pollack (1988-05-26). "Phone System Feared Vulnerable To Wider Disruptions of Service" (PDF). New York Times. Retrieved 2013-07-30.